Students pursuing a research PhD work with world-class faculty in facilities that spark creativity and discovery. In novel programs, they work alongside professionals, forging valuable alliances within their chosen field. Our doctoral students seek solutions to 21st century problems. Candidates work alongside world-class faculty in facilities designed to inspire creativity, foster exploration, and fuel discovery. Learn more here. Northeastern is pioneering a new form of doctorate—one that amplifies lab and classroom learning with fellowships and internships at companies, research institutes, or nonprofits. Instead of one faculty mentor, students have a second in industry. While broadening their network, students gain access to leading innovators, publishing opportunities, and career paths. Explore the complete list of PhD programs here. Kim Lewis and Slava Epstein, professors of biology, rocked the science world when they discovered a new antibiotic that killed bacteria without encountering resistance—and a strategy for identifying additional microbe killers. Ryan Cordell and David Smith, professors of English and computer and information science, respectively, launched the Viral Texts Project, which is mining digitized, 19th-century U.S. newspapers and magazines in order to understand why certain stories were so often reprinted, effectively “going viral” across the country and beyond. Octavia Camps and Mario Sznaler, electrical and computer engineering professors in the Awareness and Localization of Explosives-Related Threats (ALERT) lab—a Department of Homeland Security Center of Excellence. The pair have created video surveillance software with promise for improving airport security. Since 2006, Northeastern has recruited more than 600 outstanding faculty members—many with joint appointments that empower them to probe the knowledge gaps between disciplines. Our doctoral candidates are accomplished scholars, striving to respond to society’s most pressing questions, issues, and needs. Many have earned prestigious awards, from Fulbright scholarships to Harvard University’s Rappaport Public Policy Fellowship. Distinguished Dean’s Fellowship — Northeastern awards this fellowship to exemplary students who demonstrate exceptional promise. GEM Fellowship — Northeastern serves as a host for GEM (Graduate Education for Minorities), a network of leading universities, companies, and government agencies. GEM’s members collaborate to provide graduate education in engineering and science to underrepresented minority students. NSF Graduate Research Fellowship — The National Science Foundation supports students in NSF-supported STEM (science, technology, engineering, and math) disciplines who are pursuing research-based graduate degrees. Embedded Employee Fellowship, Corporate Graduate Fellowship — Within these new, innovative, company-funded programs, doctoral students work alongside an industry mentor. Northeastern doctoral candidates continue to push boundaries. 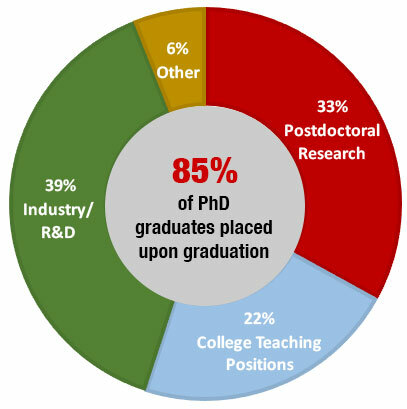 In 2017, 85 percent of our doctoral students were placed: 33 percent did postdoctoral research, 22 percent secured college-level teaching positions, and 39 percent embarked on careers in industry and R&D.